Photographing a brochure leads to distortions (thanks regardless to Richard “Widescreen” Brain), but use your imagination to square up and sharpen the new Raymarine ST70+ image above. Then understand that this 6.5” 640 x 400 pixel screen is capable of showing all the SeaTalkNG/NMEA 2000 navigation, engine, and systems data promised in the original ST70, and I think you’ll agree that this is a welcome product indeed. 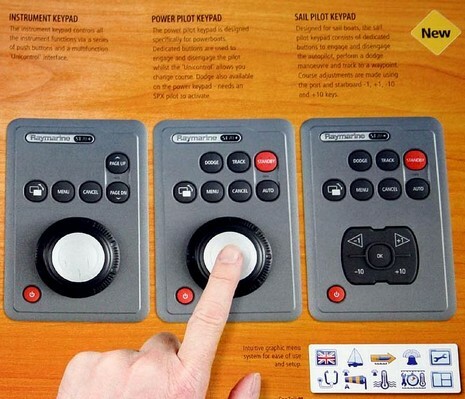 But where are the control buttons? Well, frankly I’m a little confused—despite a thorough reading of the brochure Richard sent—but there definitely will be three keypads available to run ST70+ displays. Shown below are an instrument keypad, a powerboat autopilot keypad (the ST70+ can also be a pilot display), and a sailboat pilot pad. What I don’t understand is whether the instrument keypad can also run an autopilot, or the pilot pads can run instruments, or what. But I’m sure we’ll learn soon, if not very soon thanks to Panbo readers who were at the London Show. One thing that’s obvious in the brochure is improvements on the already neat ST70 data screens (and here), which I imagine will migrate to the original instrument. As mentioned yesterday, I’m also hoping for data type additions—like rudder angle and fuel management—and, even more important, improved system integrity. 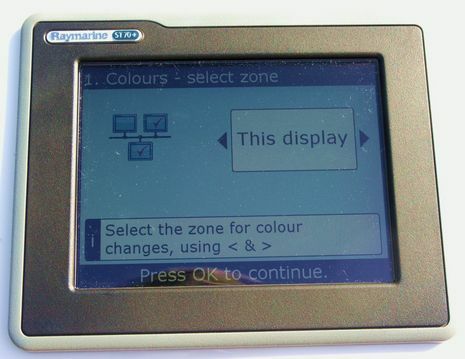 I like the ST70 series a lot, and the test unit in the lab’s network plays well with others, but apparently Raymarine has been recommending not connecting them via NMEA 2000 to networked E Series displays until certain software glitches were fixed. Which has caused some pain out there in the field. Hopefully that STng/ST2/N2K embarrassment is about to become history. Geoff, No doubt the two pilot keypads can run an autopilot, but can they also control instrument displays? Can an instrument keypad also control an autopilot? It may come down to whether or not one keypad can control more than one ST70+ display. I say that because the brochure may it sound as if a displays can be set up to be either an instrument data or a pilot but can’t page through both. Having the buttons on the display itself is fine if the display is within reach (but a touch screen is better). But if you use the display from further away a remote control is better (as any TV viewer knows). I haven’t met a remote control I like yet, but I know it’s out there. It’s called an iPhone and it just needs a simple app from Raymarine or Garmin or Maretron or someone to control an N2K display and even be a display itself. It could be a remote for the autopilot, a remote for the VHF, stuff like that. Even further, I would like to keep my computer down out of the weather, so an app which would allow an iPhone to be a remote display for that computer and mouse would be very nice. (I don’t actually have an iPhone, but I think Steve Jobs hit gold on that product. Too bad it’s locked). Looks great in the brochure, but how does this look at night from across the cockpit? And how about power consumption? The separation of the keys from the instrument frees up some area in a standard sized display for more data, but I think you’ll want a keypad that will control multiple dipslays. And of course this design makes it tougher to upgrade existing installations since you need a place to mount the keypad. I’m amazed that the vendors don’t target the upgrade market more directly. I saw a similar problem with Icom who changed the cabling on their Command Mic with every generation making it very painful to move from say a 502 to a 503. There is a saying in marketing that your best customers are your existing customers. If you make the “switching cost” low, customers are much more likely to make the change. With more and more boats wired with NMEA2000 cabling, there will be a real opportunity to sell into the installed base, but you have to be disciplined about cabling and form factors. I have recently installed a Raymarine X-10/ST70 autopilot, probably one of the earliest to do so. I have been shocked to find that raymarines own instruments using Seatalk1, cannot talk to the ST70 autopilot control head unless you add at least one ST70 instrument to the chain. Raymarine’s response is if you do not own ST70 instruments, then you can use your raymarine multi function display to send your autopilot your Raymarine instrument data, but you have to leave the MFD on at all times, oh and the software update is not available yet so that does not actually work. The odd thing is, I can go buy an autopilot by any other brand, and it will work, via NMEA, with my ST60 instruments. But a new Raymarine autopilot, if using an ST70 control head, cannot use non ST70 instruments. Raymarine does not make this clear in any documentation. I think the Raymarine ST70 and SeatalkNG is a nice product. But with the new autopilot offering they seriously screwed up by not allowing its software to bridge Seatalk1 data to SeatalkNG like a regular ST70 instrument would. One wonders, why the X-10 course computer has inputs for both if it cannot handle both? And why the ST70 control head comes with a seatalk1 to seatalkNG adaptor, if it cannot actually handle that data? I am out almost $5000 on a new autopilot, and it cannot even steer by wind, using the same brands instruments no less! I could have spent half as much on the last generation of Raymarine autopilot and not had this problem (or heck, I could have bought a Simrad and had an easier time interfacing with my Raymarine ST60 instruments, how screwed up is that?). Granted, this shouldn’t need to be done since RM should have allowed for gen 1 SeaTalk support, but couldn’t you tie in their E85001 SeaTalk/NMEA 0183 adapter to your ST60’s via SeaTalk, then take the NMEA 0183 out to the course computer of the pilot to get Wind data to the pilot? Or will the x-1 not take NMEA 0183 wind? God I love this stuff! Its better than daytime soap opera…. The design of the first ST70 (not the auto pilot), actually is quite easy to add to an ST60 or ST60+ installation, as I have found to be the case on Breeze Pleeze. I am not sure if the X10 course computer can bridge NMEA 0183 data or not, Raymarine has not so far suggested that as an option to me. It would be ridiculous though if it could do that but not seatalk1. The X10 course computer has inputs for seatalkNG, seatalk1 and NMEA 0183. But apparently if you use the ST70 (seatalkNG) control head, you can only get wind data if you have an ST70 insturment to bridge the seatalk1 data. I could have used a last generation control head, like the 6001, and had zero problem (according to documentation). But the SeatalkNG manual says you can use the Seatalk1 to SeatalkNG adaptor cable to put seatalk1 data on the NG network. However it makes no mention that the ST70 control head is a special case which does not bridge data like the ST70 insturments do. Though one really has to wonder why the ST70 control head includes the adaptor cable if it is entirely useless to that particular insturment. Raymarine seriously screwed up here. The X-10, having inputs for SeatalkNG, Seatalk1 and NMEA, should be able to bridge all that data and actually use it. Instead it is a all one type approach, use all seatalk1, or all seatalkng, but dont mix! But oddly a single ST70 insturment can do the bridging of the data? Obviously the software has been written to do the task, why was it not included in the X-10 or the ST70 AP control head? That makes zero sense to me. I think raymarine is going to run into real issues here. The fact is, currently, if you have legacy RM insturments (n0t really legacy since they still sell them), its cheaper and easier to buy a non raymarine autopilot and interface then it is to use the latest generation raymarine AP with their own insturments. I have always been a fan of raymarine and find them to be innovative. I liken them to Apple, in that by using proprietary systems they can innovate and not be held back by industry “standards”, but ensure they are still compatible with other systems (ie NMEA). SeatalkNG and its potential is huge, esspecially if NMEA2000 data is kept as easily bridgable and compatible. But they screwed up with their AP offering. How many people like me are going to buy their new AP systems only to find they are not compatible with thier own insturments without serious additional investment? To my knowledge no RM autopilot acts as a NMEA bridge, there merely handle autopilot related network data , but dont act as a bridge. I think RM have only ever used The instrument set for this , possibly becuase the processor in them isnt doing very much and can act as a bridge. To my knowledge ST6000 & ST7000 control heads didnt bridge data either ( ie between NMEA 0183 and seatalk1)The only ever accepted NMEA0183 wind angle data. Again you had to use the ST60 instruments to get better bridging . I agree its a drawback, the right place would be in the autopilot control box. RM general policy on bridging NMEA0183( or 2000) to Seatalk is very patchy and badly implemented. Basically they never wanted anything to do with NMEA 0183 in the first place. Not to rub salt in it but it always seems that mixing Raymarine techology levels generates trouble, ie interconnecting ST40, 60, 280 70 series is a bit of a nightmare, RM always assume you will stay within the ST set. PS teh st70+ remote keyboards will to my knowledge control other instruments as well. Just some further info, The manual shows that using the SeaTalkNg to Seatalk cable the ST70 autopilot head can connect into the ST60+ system ( theres even a diagram). It doesnt act as a bridge though it just takes what it needs from the ST60 seatalk data, ie wind angle I think. Dave, based on the manual you would think it does take what it needs (ie wind angle). It however does not. The SeatalkNG to Seatalk cable only works on an ST70 insturment, not with a ST70 AP control head (which makes you wonder why they include the cable). I personally do not care if it does not bridge anything more then wind angle (and speed I think the AP actually does use that to account for gusts) data, I need my AP to be able to steer by wind, I dont care if the AP display can show me the depth or anything like that. But as it is now, wind angle even cannot be sent to a ST70/X10 autopilot unless you own ST70 insturments or raymarine multi function display with a software upgrade (not yet released) and leave the MFD on at all times. I agree, the course computer is really the place this bridging should be done. Especially since it has inputs for SeatalkNG, Seatalk and NMEA, you would really think it would. My understanding from what is being said, is that for a complete modern raymarine SPX system to work, with a previous ST60 instrument setup … one needs three things (1) SPX autopilot (2) ST70 autopilot control (3) ST70 multifunction. And if you leave out item three it will not work. To me this stands to reason. Remember that the backbone of this system is STNG (NMEA2000) … so non N2K data (Seatalk1 ie NMEA0183) has to be translated onto the CANBUS. 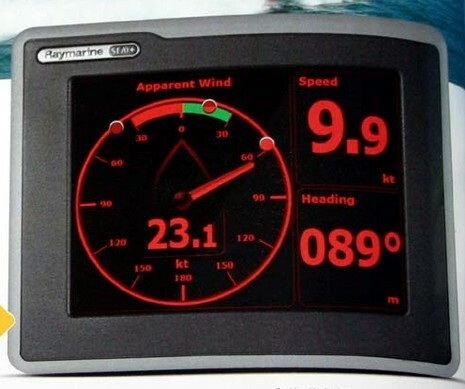 Why raymarine chose not to put a NMEA0183 to N2K translator (and calculator to get true wind speed, angle, etc) in neither the SPX or the ST70 autopilot control is sort of strange. But it stands to some reason in that neither of these devices displays or needs all of that data (depth, speed, position, rudder, temperature, engine, etc.) other that the afore mentioned wind data. Ultimately, yes this means at a bare minimum, you need to add atleast one multifunction ST70 to your system somewhere. This also stands to reason since much of the setup of any STNG devices/data is done through the multifunction ST70 menus. Matt S – Admittedly a minor feature … but I use the ST6001 control head feature where you can have a full screen display of depth, speed, etc. The depth is especially useful as my depth display / tri-data is an awkward angle where it’s hard to keep an eye on it. I’ll have to get more details from my installer, but we have the new X-10/ST70 autopilot combo on our sailboat along with a C70 and ST60/ST60+ instruments. I’m able to view all of my ST60 info on the ST70 autopilot head and control the autopilot from our C70. The only function that isn’t supported is using the heading sensor in the autopilot with the C-Series for MARPA – that’s only supported on the G-Series. I’m pretty sure we’re bridging ST1, not NMEA0183. By the way – the autopilot has worked wonderfully for us. Other than an intermittent issue where we get a “Rate Gyro Error” message on startup (turn it off, turn it on and we’re OK), we love the unit. We were in 35kt winds and 8-14ft seas off of Cape Fear, NC heading for Charleston a couple of weeks ago and the only way we were safely able to duck in to the Cape Fear River was by creating a course on the chartplotter and then slaving the GPS to it. It worked flawlessly, even with huge following seas – we’d slide down the backside of waves, bow heading right and high, stern heading left and down, and the SPX system would gradually, safely, bring us back on course. This discussion highlights my point. RM has made it a challenge to upgrade to their new system. Even if you are the most dedicated RM customer, you will end up with equipment from different generations. In fact RM should want you to do so, they should want you to upgrade something each year, generating some sales every year without any “customer acquisition” cost, but that means you’ll have multiple generations of RM equipment. If they make that painless, we’ll buy more stuff! 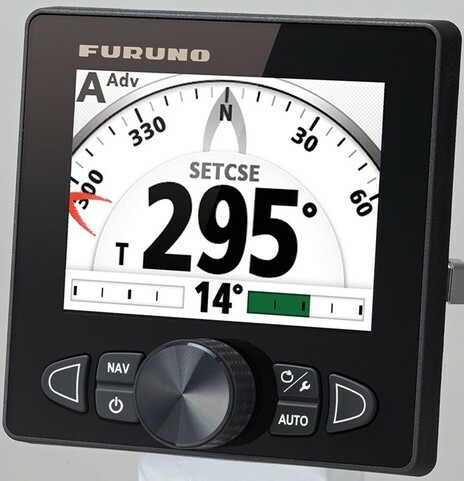 To their credit, Furuno NN3D MFDs do support NMEA 183, NMEA 2000 and NavNet 1&2 (aka ethernet) with mix/match and the ability to bridge NMEA 183/2000. 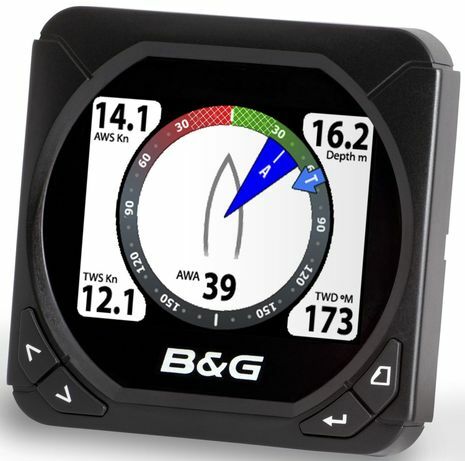 Anybody know how/if Garmin or Navico handle this problem? Chris, if you turn off your C70, do you still see the ST60 data on your ST70 AP control head? But … on the ST70, you can’t have the two dots appear on both port and starboard … e.g. when you tack it resets. (althought I guess that could be a function of your choice of powerboat or sailboat from the instrument setup. Anonymous – I turned off the C70 and I still see depth and wind speed on our ST70 AP control head. In the case of a ST60 wind insturment and a X-10 course computer with a ST70 control head but lacking a raymarine MFD or at least one ST70 insturment to do bridging: The X-10 CAN steer by wind, but the ST70 will not display wind data, set it to steer by wind and it will so long as the ST60 is connected to the X-10. While not ideal (the X-10 should do bridging IMO) it at least works. Raymarine have this habit of producing nearlyware. Its almost brialliant. The problem is, they think that you will update all of you electronics everytime they bring out a new series. An example, did you now that the ST60 multi acts as an NMEA bridge. Great. Except for date. Now I had a Garmin GPS putting out NMEA, aleady plumbed into the Multi. The tide function on the MFD needs date. My yacht is now 10 years old, I’ve got ST60, ST60+, ST80 and C series MFD. One of the ST80’s is about to die. I’ve been looking at an upgrade. But of course, the ST80 is long gone, so replacing like for like is not an option. Previous experince says I need to tread carefully. Sadly, none of the dealers know enough. The only way to be sure is to take the plunge and try … or not. The ST70+ does look good though, but what would I be biting off??? Will it talk to Seatalk 1 happily. I haven’t seen any mention of tide set and drift? Will it provide me with wind and tide arrows (like on the MFD)? Will it provide a history graph of VMG, or even better a dual/triple graph of VMG, TWS and GWA? If not .. why not … surely it has all the info. Or maybe more nearlyware. I hope not.